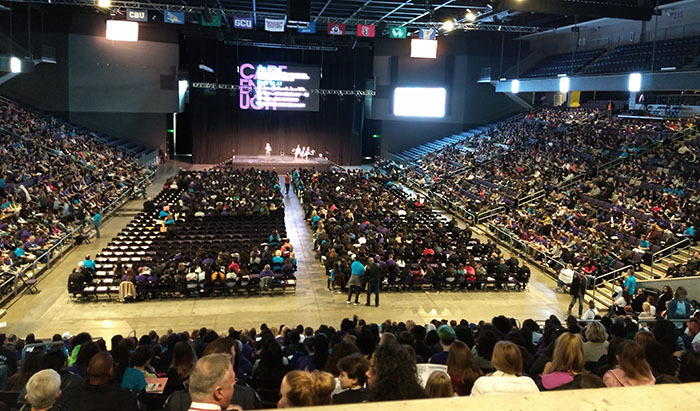 An estimated crowd of 5,000 sixth- to ninth-graders were in GCU Arena for the third annual Speak Up Stand Up Save a Life Youth Conference. Back in the day, we always had to tiptoe around Biff the Bully and Gladys the Gossip. Walking to and from school (uphill into the wind in both directions, of course) could feel like going through a combat zone. The halls of academia sometimes felt hellish, not hallowed. We had to eat the same baloney-on-white sandwich all the time – unless Biff took it away. And if we dared to complain to our tormentors or, oh my word, had the audacity to tattle on them to a teacher or administrator, we could expect something much worse in retaliation. We thought we had it so tough. Students at the conference were tasked with taking what they learned back to their schools. Then we look at today’s kids, with their easy access to the internet and other modern conveniences, and we think they have it so easy. What could possibly be amiss compared to what we went through? 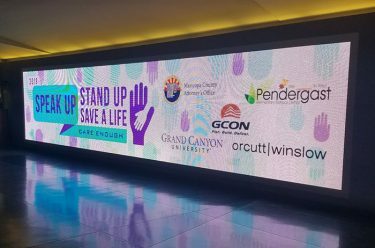 The third annual Speak Up Stand Up Save a Life Youth Conference on Tuesday at Grand Canyon University Arena answered that question as directly as a punch in the nose. Things have gotten much, much worse in schools these days. The people who work there profess it, and the suicide rate among young people proves it. The biggest culprit? Those modern conveniences. The internet enables Biff and Gladys to do their dirty work in private. “It’s easy to hide behind social media and call someone a punk, ugly, dirty, which is why it’s getting worse nowadays,” said Dr. Lily Matos DeBlieux, who along with Gina Godbehere started the Speak Up organization. “They can be having a beautiful day and, all of a sudden, they open up social media and there they are – people are talking about them, sending out bad pictures about them. The anti-bullying crowd has a tool of its own in Speak Up, which was in such demand this year that registration, which was thought to be full before Christmas, had to be reopened. 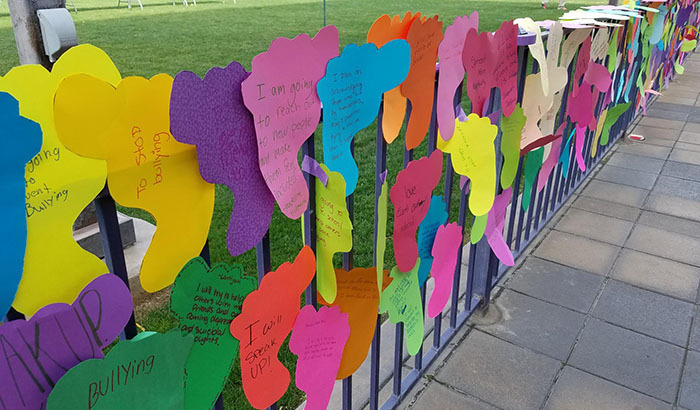 There were 156 schools represented, 48 more than last year, and an estimated 5,000 sixth- to ninth-graders came to the conference as representatives assigned to report back to their classmates and implement the event’s many messages. This was the second year the event has been in the Arena. But this is about more than just the schools. There also were 12 police chiefs, eight assistant chiefs and 138 officers from 28 agencies. It’s a grassroots movement that has grown quickly because of its coalition. The opioid crisis is believed to be another sign of the desperation too many young people feel to escape the toxicity of their daily environment. School officials are desperate for antidotes and believe that the key – as the organization’s name suggests – is to get students to speak up. 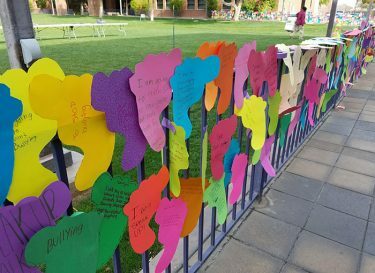 Students wrote about what they plan to do to prevent depression and suicide among young people, and their work was displayed on the fence around the Quad. Speak Up aggressively fought those feelings by having representatives available to do counseling during the event. 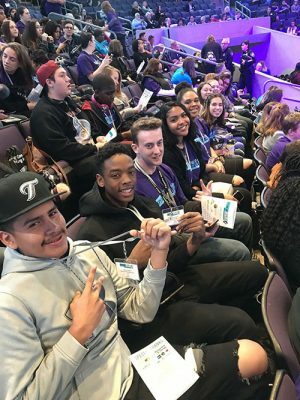 Organizers happily spoke of the positive feedback they got after last year’s conference, particularly from schools that established anonymous texting to give the students a stress-free means to report if they suspect someone might be facing depression issues or worse. One school documented that it prevented four potential suicides. At another, a student who was cutting himself was convinced by the conference’s message to seek help. Tuesday’s proceedings began with welcomes from Godbehere, Matos DeBlieux and Maricopa County Attorney Bill Montgomery. “This is where school safety starts,” Montgomery said. The Cre8tive Theatre Troupe’s skit laid out a number of scenarios that can lead to depression or even suicide. The keynote talk was by Jeremy Anderson, who has written seven books on the subject and told of how he acted out as a child because, among other things, he has never known his biological father. There also were “Warning Signs” and “How to Have the Conversation” videos as well as awards and workshops for the students plus a separate session for adults. “I’ve spoken at national conferences, and I’ve had adults sob on my shoulder and say, ‘I need this, too,’” Matos DeBlieux said. Biff and Gladys might not like the answer.